Reflect the balinese essence style design to villa Double N, Environment design and well intergrated at villa. Meet the villa with magnificent tropical garden, Adding to your private space the amazing swimming pool to enjoy and relax. With the bedrooms overlooking the villa gardens and rice fields. At your full command, the villa manager supervises seven staff including your personal chef with both international and local culinary skills and pool attendant , all on call. The villa is fully connected with the world international satelite TV, Wifi and sound system. 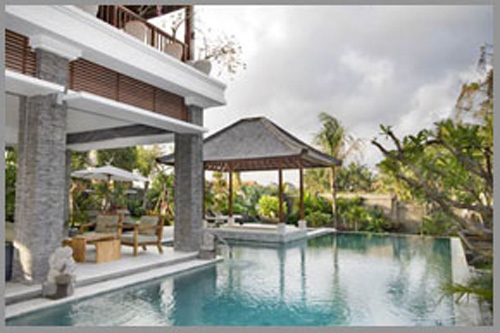 Villa Double N is set amid the verdant area of Canggu, around 40 minutes from the airport. The villa is a gentle 13 minutes walk from the beach and 20 minutes from the famous and fabulous Nirwana Golf Course. For those wishing to sample more, the villa is 15 minutes from Seminyak, which has some of the best dinning, entertainment and shops in Bali.